Although Dudeism is a religion of takin’ er easy, there’s one thing we get all worked up about, and that’s…Takin’ er Easy! This year on March 6th we’re going to get fired up about chilling and make it official: It’ll be the first annual sacred Dudeist high holy day, The Day of the Dude. Every religion needs its high holidays, and no religion takes taking a break more seriously than Dudeism. Though we considered many days for the holy day, we settled on March 6th because it’s the day that The Big Lebowski was bequeathed unto the world way back in the year of our Dude, 1998. At first we considered April 20, but that had already been taken by the Church of the Subgenius; then we though to have it on September 11th as that’s the day the Dude writes on his check for 69 cents at the beginning of the movie, but of course that would be offensive to many folks. So finally we settled on March 6th, the Day of the Dude. So that’s when and what you call it. Probably in the future we’ll have more high holidays strewn throughout the year but you’ve got to start somewhere. We recommend celebrating The Day of the Dude by getting together with like-minded Dudeists, drinking white Russians, watching the sacred film, and going bowling. Spend it alone in your private residence by taking a bath with candles and tapes of whale sounds. Go to the beach (or the river, or the lake, or the swimming pool) with some pals and symbolically scatter the ashes of the previous year (suggestion: the ash from some naturally-occuring herbal substance will do). 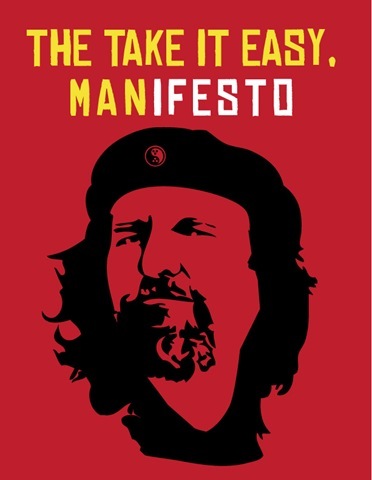 Get dressed up in your robes, shorts, sunglasses and sandals and pass out the Take it Easy Manifesto at your local shopping mall. Organize a full-on Jackie-Treehorn style garden party. Set up a stand in a public area and ordain people into the Church of the Latter-Day Dude. Yes! If you’re ordained as a Dudeist Priest you have that power! You only have to get their name and their email address and email us the list. Or, even better – set up a laptop and a printer and do it for them right there on the website, then give them a free printout of the online certificate. People will definitely dig your style. Drive around while listening to Creedence, or the movie soundtrack and enjoy the occasional acid flashback. Make some strongly commendable Dudeist art and send scans of them to us for our online gallery. Go for a long walk and don’t answer your phone all day. Get a discussion group together to discuss The Big Lebowski, Great Dudes in History, Dudeist philosophy, etc. Write an article about how you spent the Day of the Dude and send it in to the Dudespaper via center@dudeism.com. The best one will receive a free copy of the Dude De Ching! Engage in a natural, zesty enterprise with a willing partner. Then tell each other about yourselves over cocktails and what-have-you. Go to In-N-Out Burger, or make your own. If you’ve got any other ideas, please put it in a comment below this article or email us at center@dudeism.com. This year is an especially timely day for the Day of the Dude because the Academy Awards will be the following evening, on March 7th and we should all be saying dudely prayers on the Day of the Dude that Jeff Bridges will win the best actor award for Crazy Heart! He’s the odds-on favorite, so Dude willing, the earthly avatar of our eternal cosmic Dude will finally get the recognition he deserves, at least by the square community. If you do celebrate the holy day, please send us photos and/or video of your blessed event. We’ll post them here! Also, if you want to organize a large-scale event and want some publicity, let us know and we’ll promote it for free at The Dudespaper! Lebowskipalooza – Canada’s biggest Lebowski event. Originally scheduled for March 3rd, it got towed it to the 6th to coincide with the Day of the Dude! Jam night with Wii Bowling and movie screening with the Dudely Lama at The Jam, on the beach in Thailand. Dudeship of Thailand Aiden Tolhurst hosts Bowling Night in Chiang Mai. At Lanna Bowl (inside the northwestern corner of the moat). 8pm. Mini Lebowski Festival at Nampa Bowl at 6pm. Screening of the film complete with Caucasians, Oat Sodas and Sarsaparilla to follow. Email Drew and Brandt will fill you in on the details. Jackie Treehorn-Style Garden Party including: caucasians on the house, free bbq, whale sounds and what-have-you. There will also be at least one (1) nihilist passed out in the pool at all times. Contact miko.salo@gmail.com for more info. Party at Dude Vinci’s Bungalow. Oat Sodas, Caucasians, and pizza will be served and a Wii Sports Resort Bowling Tourney will be held. Contact Jesse for more details. Great idea Dudes, and you’ve given many good suggestions. The one on ashes is pretty cool, I’ll do it also next 31 of December. I’ll try do do most of them, watching the movie for sure. :) I dig your style Dudes, far out. So what day is this? Don’t forget Lebowski Palooza in Winnepeg, Canada man. Great chance for the Canadian dudes to come out in force! We’ll be posting an interview with its founders in a couple of days. Mini Lebowski Fest at Nampa Bowl in Idaho at 6pm. Screening of the film complete with Caucasians, Oat Sodas and Sasparilla to follow. Email me and Brandt will fill you in on the details. Oat Sodas, Caucasians, and pizza will be served and a Wii Sports Resort Bowling Tourney will be held, but that’s like, if you want to participate, man. Really we just aim to take it easy. Well said, Dude. I like yer style. One thing to mention, the link to the Manifesto is broken. Looks like the last “o” got clipped from the URL. Damn, man. Makes me wish I didn’t have to roll on Shabbas, man. Rest assured, Dudes, this Dude will be takin’ her as easy as she can from behind the till at her supermarket. And I’ll be singin’ Creedence all day long, man. I’ll take ‘er easy for real on Sunday instead. Have a Dude Day, all! Once I celebrated Dude Day on August 6th, being that the day when Bush senior said “this aggression will not stand” and therefore it’s likely to be the day the Dude’s adventure really started (being the date on the check an error). Congrats on the win last night Dude! Today, while sending the band a link to Dudeism.com, I see that March 6th was a magical date. Day of the Dude. We somehow got the message. Just added this to my instant queue. I like your site very good information. What’s up with the murderer of thousands of people Che lookalike T-shirt??? That man is so opposite of duude. Disgusting! Love it when things tie nicely together like that. Previous Post: You Don’t Go Looking For a Job Dressed Like That Do You?